Check out the testimonials to see what people say about Kolorkraft. 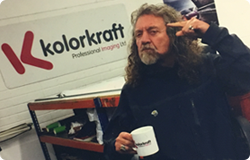 "Fast, efficient, high quality, charming and record breaking speed in getting great results… I would go nowhere else, this is the place to be… KolorKraft!" Led Zeppelin, Band of Joy, The Sensational Space Shifters. "KolorKraft provides the RSPCA inspectors and prosecutions department with bespoke service in supplying all our digital imaging needs. It is a complex service providing assistance to over 400 field staff. The service is prompt and efficient providing excellent value for money." "I've worked with KolorKraft for 4 years and have always been impressed with the flexibility, speed and competitive pricing. The quality of service from initial conversation to delivery of the finished product is first class." St Oswald’s CE Primary School. "Quality is excellent, service is great. For a company like us it’s like having your own in-house printer, they’re part of our team." T.I.C. Photography – Google trusted photographer. Copyright © Kolorkraft 2019. All rights reserved.